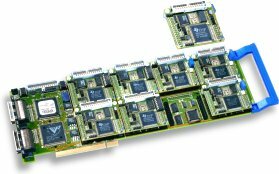 The DCX-PCI300 motion controller is a full-length PCI-bus card that combines advanced DSP technology with the modular multi-processing architecture first pioneered by PMC more than 28 years ago. Each DCX-PCI300 motion controller consists of an intelligent PCI control card populated with any mix of up to eight (8) intelligent plug-in function modules. Function modules are available for servo and stepper control, AC brushless servo control, digital I/O, and analog I/O. Dual-Axis modules are also available for controlling two servo or stepper axes per module, for a total of up to 16 axes per control card. Compatibility ""-R" suffix in the part number denotes compatibility with the standard ribbon cable version (DCX-PCI300-R) of the DCX-PCI300 motion controller. "-H" suffix in the part number denotes compatibility with the high-density SCSI cable version (DCX-PCI300-H) of the DCX-PCI300 motion controller. Compatibility Dual Modules are designed for the DCX-PCI300-H "high-density SCSI cable" version of the DCX-PCI300 motion controller. They are not compatible with the DCX-PCI300-R "ribbon cable" version. Part Number DCX-MC400-R: For use with the standard ribbon cable version (DCX-PCI300-R) of the DCX-PCI300 motion controller. DCX-MC400-H: For use with the optional high-density SCSI cable version (DCX-PCI300-H) of the DCX-PCI300 motion controller. Part Number DCX-MC500-R: For use with the standard ribbon cable version (DCX-PCI300-R) of the DCX-PCI300 motion controller. DCX-MC500-H: For use with the optional high-density SCSI cable version (DCX-PCI300-H) of the DCX-PCI300 motion controller. The DCX-PCI 300 Series of motion montrollers use one of two different interconnection schemes, depending on the DCX-PCI-300 motherboard model used. One model is the high-density "-H" version, part number DCX-PCI-300-H, the other is the the ribbon cable "-R" version, part number DCX-PCI-300-R. The DCX-PCI-300-H (High-density SCSI connector) model allows the use of high-density VHDCI-to-VHDCI SCSI cables with the DCX-BF3XX-H interconnection board shown below. Note: The DCX-PCI-300-H also supports the -R (ribbon cable) version of the plug-in modules, but to take advantage of the high-density SCSI connectors, -H versions of the plug-in modules must be used. The DCX-PCI-300-R (Ribbon connector) model uses the same 26-conductor IDC ribbon cables that the rest of the DCX product family uses. The "-R" version of the DCX-PCI-300 motherboard is not compatible with high-density SCSI cables and requires the use of -R version plug-in modules. Connections Quick release "cage-clamp" terminal strips, grouped by function (motor, primary encoder, auxiliary encoder.) Each terminal pin is individually labeled for easier wiring. Input Connector 26-pin Male IDC ribbon cable header. Description Low-cost universal 68-pin SCSI wiring terminal board with DIN-rail mount. One ADAM-3968 accommodates up to 2 axes of I/O. Connections Provides 68 numbered screw clamp terminals arranged in two rows of 34 for easy access to the individual pins of the 68 pin SCSI cable used with MultiFlex PCI Series controllers. Use With Any MultiFlex PCI series motion controller. Or with any MultiFlex ETH 1040, 1400, 1440 and 1802 motion controller when using the ICN-100 SCSI Interconnection Board. Can also be used with DCX-PCI300-H series motion controllers (contact PMC factory for the appropriate pin-out documentation). Connections Quick release terminal strips, grouped by function (motor, primary encoder, auxiliary encoder.) Each terminal pin is individually labeled for easier wiring. Cable Lengths 2 Meter (6ft.) cables available directly from PMC. Other lengths (0.5M, 1M, 2M, 3M and longer) are widely available from SCSI cable vendors. Click here for information about alternative cable sources. Use With Controller P/N: DCX-PCI300-H. Note: One cable accommodates up to 2 axes of I/O. Description Industry-standard 68-pin offset 0.8mm VHDCI ("SCSI-5" "Micro-centronics") Male to 68-pin HD68 ("SCSI-3") Male cable assembly. Cable Lengths 6 ft. (2 Meter) and 12 ft. (4 Meter) cables available directly from PMC. Other lengths are widely available from SCSI cable vendors. Click here for information about alternative sources. Click here for information about alternative cable sources. 95.020.6 - 6 ft. (2M) cable assembly. Description Generic 26-conductor IDC Female to IDC Female ribbon cable assembly. Connects DCX Modules to Breakout Boards. Cable Lengths 6 ft. (2M) cables are available from stock. Custom lengths can be built to order, but lead times may apply. See below for information on building your own ribbon cables. Use With Controller P/N: DCX-PCI300-R, DCX-PCI100, or any legacy DCX Series motion controller such as DCX-AT300 or DCX-PC100. IDC ribbon cable components are inexpensive, widely available and easy to assemble. As a result, most customers choose to buy and assemble these cables themselves. Part No: 9L28026, or equivalent. Description: Box of 100 ft. (30M) 26-conductor ribbon cable. Part No: 26IDS2-C-SPT-SR, or equivalent. Note: A small 3-4 inch (8-10cm) mini-vise clamp is useful (though not required) for installing the IDC connector onto the ribbon cable. Powerful and flexible software tools are crucial for the success of any complex automation project. PMC provides machine designers with a comprehensive Motion Control API (Application Programming Interface) which includes DLL's, extensive help files and numerous useful sample programs with source code, for C, C++, C#/.NET, VB and Pascal programmers, as well as Motion Integrator, an extensive suite of graphical and intuitive setup, tuning and diagnostic utilities. DLL's, sample programs, source code and extensive help files for C, C++, C#/.NET, Delphi, LabVIEW & VB programmers. Drivers for Windows 10/8/7/Vista/XP/2000/NT and Linux (for RTOS support, contact PMC). Native support for 64-bit Windows, Microsoft .NET framework, and 64-bit Linux. Easy-to-use on-board command language (PDF 46KB) is also included on all products. Includes Motion Integrator™ - graphical servo tuning, setup & diagnostic suite. Compatible across PMC's family of motion controllers. No hidden costs - all PMC software is included at no extra charge. Our software tools are designed to help machine builders get up-and-running quickly, whether their control program requires just a few basic commands, or the complexity and sophistication of a multi-threaded C/C++ application. To further simplify the integration task and to eliminate any hidden costs, all software is included at no extra charge. And to ensure that users get the most out of their programming investment, PMC software is compatible with all PMC motion controllers - offering forward and backward compatibility as well as the assurance of an easy future upgrade path. Motion Control API - PMC's suite of programming libraries, drivers, help files, sample programs (with source code), and utilities for C/C++/C#/.NET, Pascal, LabVIEW and Visual Basic programmers. Flash Wizard™ - A useful Windows tool which greatly simplifies firmware upgrades on all of PMC's motion controllers that use Flash memory technology for firmware storage. Makes customer firmware upgrades a snap! Motion VI Library™ - Support for motion control programming in National Instruments' LabVIEW and LabWindows/CVI graphical programming environments. Motion CD - PMC's Motion CD is a hard-copy source for all software libraries, drivers, sample programs, utilities, and documentation. Note: Some PMC Product Manuals have been compressed into ZIP files and may require passwords to unzip them. Use this handy online form to request a password, or call us at +1-760-930-0101. Brochure Detailed description of features & specifications for the DCX-PCI 300 motion controller. Data Sheet Side-by-side comparison of specifications for Single-Axis vs. Dual-Axis servo and stepper control modules for the DCX-PCI300 motion controller.